Can we go ahead and get this started? How about posting all the pictures info and videos here? Hope to see some soon. My review will come Thursday, Jwood I do believe is first up to Bat of the Larueminati! it seems the Midgets and blow got him. What, y'all blew a midget? Keep in mind that my opinion is worth what you paid for it. Boy is it cold here! Word of advice from those of you heading this way. Watch the wierdos on the street dressed as cartoon characters! The only ones I would mess (and did) with are the naught female police officers takeing photos! I did very bad things and needed hand cuffs! Its only 4 minutes and it will be over with! If you need to puke go outside. Beginners work on trajectories and come ups, masters work on doping the wind. The later keeps challenging me. - Me! Me too. Ill be there bright and early Thursday morning. But it's a "dry" cold.....right!?!? Yes! But its not San Diego weather! So I dont like it! This going from a warm casino to a cold outside is killing me! I need to find a Black Jack table later. The Tropicana was very very very good to me last night! So any news on the show or just the hookers and blow? Hookers and blow at the booth this year? Sweet. Dillos are gold, I did not see anything new from LT.
Magpul had some 5 and 10 rd magazine bodies and I think they had an AK pistol grip out. Surefire had llanty of new lights. It just sounds like the gun world is trying to play catch up and waiting on what the idiots in the big White House decide. I'd trade someone something if they can snag two! 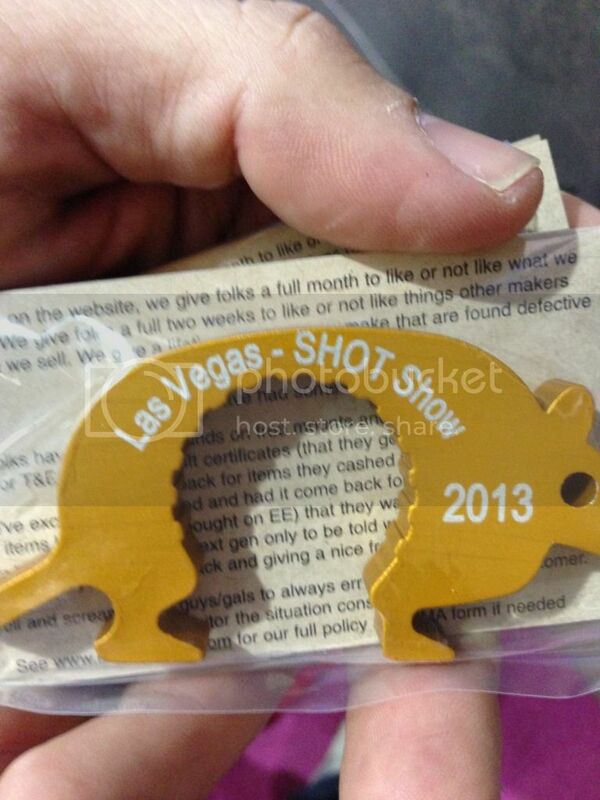 MAN I'd Like a SHOT SHOW Dillo 2013 if anyone can snag me one. PLEASE!!!!!!!!!!!!!!!!!! Praise be to the Lord my rock, who trains my hands for war and my fingers for battle. Does LT have the PredatOBR's (7.62 and/or 5.56) on display? THERE IS A WHOLE THREAD DEDICATED FOR THAT! Now, about the 5.56 SCOBR! go on! With regards to the scobr and tOBR. It seems to me that they are one in the same now. The tOBR was the hybrid tAR/OBR. The suitcase rifle was a quick break down version of the OBR. It seems they mergers the two ideas to me. 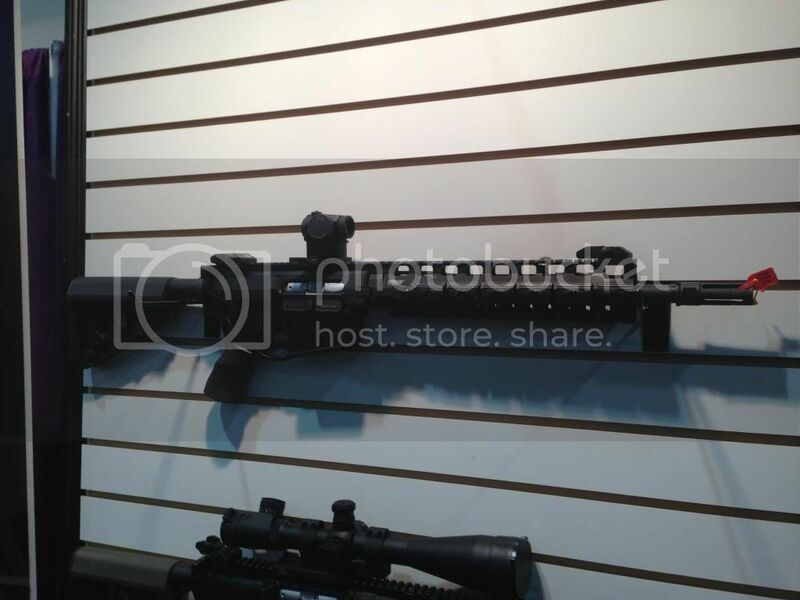 I did not see different rifles, I saw a tOBR with quick takedown cam locks on the handguard. I could not tell if MOA was built in the rail or not but to my naked idea and small iq it seems they are merged. I saw a tOBR with quick takedown cam locks on the handguard. I could not tell if MOA was built in the rail or not but to my naked idea and small iq it seems they are merged. So it's ok for everyone to talk about SCOBR's that have had pictures posted and multiple threads talking about them. But the one thing that is actually not seen until SHOT no one is allowed to talk about??? So wait? You got to see a scOBR? 7.62 or 5.56? Very interested in this. More details please. Well if I can't get a DILLO I'll settle for a 5.56 SCOBR!!! Can't wait for 5.56 SCOBR pics! Then, after SHOT, they can just toss her in a toolbox and mail her to my FFL,!!!! WTF someone post something already! Haha that's what I meant. Nothing from LaRue but seen plenty of other stuff. So you took a picture of a dillo but nothing else? Awww c'mon, take one for the team. Just kidding of course. Thanks for the update and keep them coming! Nothing really new at SHOT except Gold Dillos. Got to hold the 7.62 tOBR. Nice piece. It's NOT light. Feels like it will be a rather sturdy, accurate piece. No 5.56 tOBR . They don't have one finished yet. No ETA on anymore Costas. Remember the old chinese curse: "May you live in interesting times" ? Well, you ARE living in interesting times. The whole industry is in turmoil. Four manufacturers ( but not LT) told me there is a worldwide shortage of barrel steel. If BO includes those barrel blanks in his EO banning foreign made gun parts, then things will really dragout. Tomorrow will be Black Wednesday. Join us in screaming at the TV at 11:45 EST on jan 15,2013. FBHO. Saw and held the 7.62 SCOBR today. Booth was absolutely mobbed. The gun is definitely not light BUT feels better in the hand than the LMT LM8, colt 901, other Sr25 pattern guns and feels a tad lighter. I did not get a break down demo of the gun as I did not ask for one and did not want to impede larue as their booth was mobbed today. I did get a missed call today while I was at SHOT regarding my pre-order for the SCOBR (order # 252xx) Crazy times we live in. Ok. Just talked with the staff at the LT booth. The tOBR and suitcase rifle have merged and are the same rifle now. In both calibers. 0 MOA on both also (built in upper). The photo is from my spy, and I don't know. It looks like a 14.5" to me, especially with the length of the brake, but that is just a guess on my part. My spy secured the necessary SWAG, and moved on to other booths. The 7.62 SCOBR at the LaRue booth was a 14.5" and it was a beauty of machning. There was no 5.56 SCOBR. The LaRue booth was mobbed. Nugent was at LaRue's booth for awhile.